"Wrinkles occur as part of the natural aging process. Areas of the body where the wrinkles may become more visible are the face, neck, hands and arms. At the same time, small wrinkles known as expression lines, which, as the name suggests, develop around the mouth, eyes and forehead. The appearance of wrinkles and expression lines are greatly determined by a person's genetic structure. Other factors like sun exposure, diet, environmental (air) exposure to pollution and smoking can accelerate the so-called “aging” process. With its anti-aging formula, Cicatricure Eye Contour cream will help smooth the appearance of fine expression lines around the eyes. Helps revitalize and nourish the skin around the eye for a more youthful appearance. Specially formulated for delicate areas around the eyes. 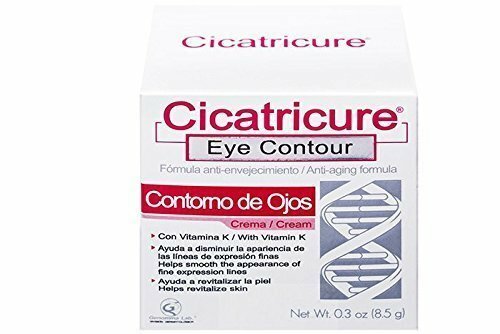 Using Cicatricure Eye Contour cream will: • Helps smooth the appearance of fine expression lines, puffiness, and dark circles. • Helps revitalize the skin"
Special peptides to help provide smooth and even skin tone. Botanical extracts include Cocoa seed butter, Shea butter extract sweet Almond Fruit extract and others. If you have any questions about this product by CICATRICURE, contact us by completing and submitting the form below. If you are looking for a specif part number, please include it with your message.